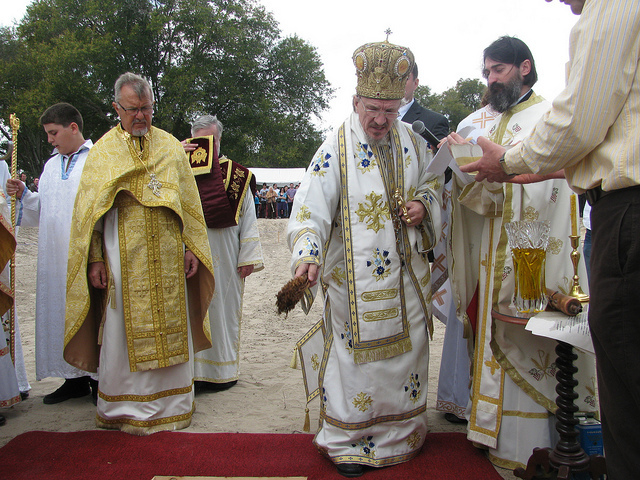 Orlando, FL - Sunday February 20, 2011 was a joyous and historic day for St. Petka Serbian Orthodox Church of Orlando, Florida. Clergy and faithful came from great distances to be present for this most special occasion. His Grace Bishop Dr. MITROPHAN officiated at the Hierarchical Divine Liturgy. Protonamesnik Ljubisa Brnjos was the host priest. Additional Diocesan clergy serving with His Grace included Protopresbyter Stavrofor Jovan Todorovich, Protopresbyter Stavrofor Dr. Rodney Torbic, Protopresbyter Stephen Zaremba, Protopresbyter Djokan Majstorovic, Protopresbyter Dragan Zaric, Reverend Father Milorad Orlic, Reverend Father Stanislav Kravljaca, Reverend Father Miladin Blagoljevic, and Reverend Father Dragan Zaric. Visiting clergy serving included: Very Reverend Stavrofor Constantinos Tzigas , Very Reverend Nikolas Rigas, and Protodeacon Michael Malinowski. His Grace Bishop Dr. MITROPHAN spoke with conviction and specificity regarding the Gospel account of the Prodigal Son. His Grace spoke about the sinfulness of each person and the immeasurable love of God willing to receive the individuals repenting. His Grace described the love of the father joyfully receiving his returning son as an example of parents’ immeasurable love for their sons and daughters. The older son’s reaction was discussed by His Grace. Believers must guard against being judgmental about brothers and sisters-in-Christ returning to the Church. During the Divine Liturgy, His Grace described the dedication and fruitful work of parish priest Father Ljubisa Brnjos. In recognition of his dedication to the parish and the progress being made, His Grace elevated Father Ljubisa to the rank of Protonamesnik. This was a joyful moment for all in attendance. The building of a church is a confession of faith. The building of a church is an expression of love for Christ. The building of a church is a preparation for the continued building of souls. A church is a source of nourishment for the soul, a place of peace, a place of healing and joy. The building of a church advances the work of Christ until His glorious Second Coming. At the program which followed the blessing of the beginning of construction, His Grace Bishop Dr. MITROPHAN commended and thank Protonamesnik Father Ljubisa Brnjos, the Executive Board of the St. Petka Serbian Orthodox Church and the faithful of the parish for their efforts. Great sacrifice, dedication and love for Christ brought the parish to the present point of beginning construction. His Grace called upon St. Petka-Parasceva to continue to be an intercessor and protector of the parish as the construction proceeds to completion. The Hierarchical Divine Liturgy, the blessing of the beginning of construction and the afternoon program reflected this parish is clearly linked with and is continuing in the way of St. Sava and the Serbian saints. This was great and wonderful day to give glory and thanks to God for the abundant blessings bestowed upon St. Petka Serbian Orthodox Church in Orlando, Florida. The early beginnings of the parish were vividly brought to mind. His Grace blessing the beginning of construction, the overflowing presence of clergy and faithful present brought observers to consider the progress made as a miracle of God.